Toothprints® was developed by a pediatric dentist who began using dental bite impressions as a way of safeguarding his own child, and other young patients. The thermoplastic wafer records the size and shape of a child's teeth, the tooth position within the arch, and the relationship between upper and lower jaws. Like fingerprints, dental imprints are unique to every person, so bite impressions serve as an accurate method of identification--not even identical twins have the same bite characteristics. A Toothprints impression also captures saliva, which is a powerful source of human scent, thus making the wafer effective for scent-dog tracking. The saliva also provides a DNA sample. The process is very easy. We soften the patented thermoplastic wafer in a water bath, and instruct your child to "open big, big like a lion then bite down tight while I count to 10." It's that simple. 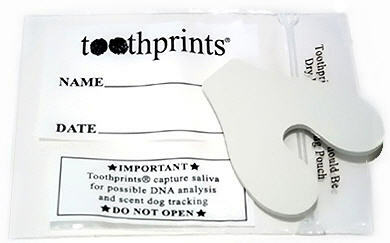 Parents keep the Toothprints disc at home in a reclosable bag (provided), for confidentiality and quick access. Update: Age 7 or 8 (or after the upper and lower teeth in front and the first permanent molars have erupted). Update: Age 12 or 13 (or after all permanent teeth, excluding 3rd molars, have erupted).